A UFO RECORDED AT COLIMA’S VOLCAN DE FUEGO? 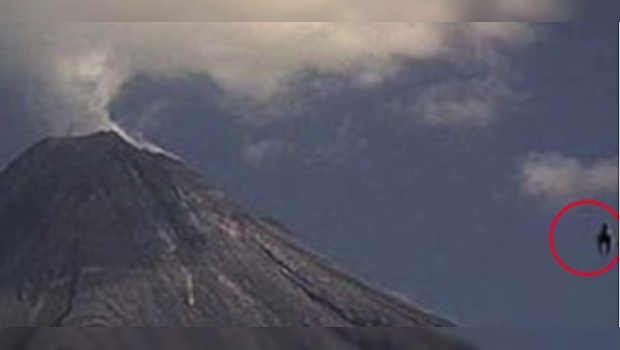 Wed 28 JAN 2015 18:32 - A photo taken by the Webcams de Mexico website shows an unidentified flying object around Colima's Volcan de Fuego during an emanation recorded this morning. MEXICO CITY - The activity of Colima's Volcan de Fuego, recorded over recent weeks, featured an unusual element this morning. The Webcams de Mexico site captured the moment in which an unidentified flying object (UFO) circles the area, which has for days exhibited emanations and explosions of incandescent material and volcanic ash falls. The image was disseminated this morning and the size of the object is not fully apparent. However, its shape presents a slender upper section, a more protuberant midsection and two extremities in its lower end. Intense activity at the volcano is ongoing, and is being monitored by the Protección Civil national office. A video was also published yesterday of the phenomenon known as a "golden explosion" in the colossal volcano's crater.